The word of the year award celebrates the inventiveness of English speakers when confronted with social, political or technological change. To qualify, a word need not have been coined within the past 12 months, but it does need to have become prominent or notable in that time. 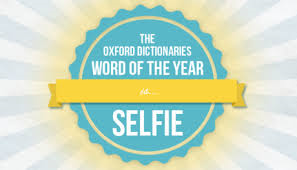 And the award goes to… Selfie the Oxford Dictionaries' word of the year! The use of this word increased by 17,000% in 2013 according to an Oxford survey. 1. Selfie is defined by Oxford Dictionaries as "a photograph that one has taken of oneself, typically with a smartphone or webcam and uploaded to a social media website". 2. Hashtag (on social media sites such as Twitter) a word or phrase preceded by a hash or pound sign (#) and used to identify messages on a specific topic. to watch multiple episodes of a television programme in rapid succession, typically by means of DVDs or digital streaming. a digital currency in which transactions can be performed without the need for a central bank. Also, a unit of bitcoin. a small furry mammal found in mountain forests in Colombia and Ecuador, the smallest member of the raccoon family. a form of meat produced synthetically from biological tissue. the practice of visiting a shop or shops in order to examine a product before buying it online at a lower price. dance to popular music in a sexually provocative manner involving thrusting hip movements and a low, squatting stance.